Humanity’s Liberation – How does one outlive the monstrosity of the Martial Law years and how do we pose the relevance of such question now when we tend to be indifferent and apathetic to events going on, both here and around the globe? The film “Dekada ’70” raises such issue and concers. Like the monster it tries to exorcise, the film spawns more question for anyone who continues oneself in relation to others and to a contemporary reality. 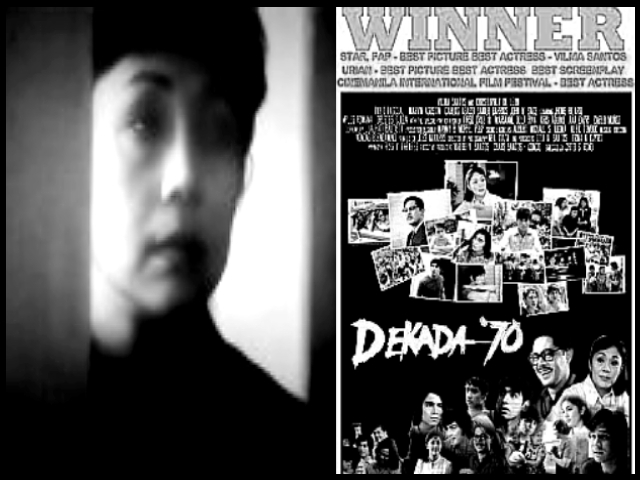 Upon watching “Dekada ’70,” one gets the impressive things haven’t changed that much since then and that we are still suffering post-traumatic syndrome of the seventies malaise. We wonder then, what went wrong after two EDSA revolutions? There’s no effective way of depicting such reckoning than by way of story and thus, the master storyteller herself, Lualhati Bautista, frames “Dekada ’70” conveniently from mother’s point of view, Amanda Bartolome’s, whose coming, into terms with the problems of child rearing, domesticity and sexual relations become the very venues for articulating change and advocacy in our political and collective life. Amanda herself becomes the point of departure for our reading. Her questions and doubts about her femininity specifically her role as a mother to Jules, Gani, Em, Jason and Bingo, and as wife to Julian, are subsumed in thelarger context of our socio-political discourse today. We are not just simply sympathizing with her, but instead we see her struggles as constitutive of whatever far future history has in store for all of us – men, women, gays or lesbians. In other words, Amanda’s liberation is the humanity’s liberation and no genuine emancipation can be realized nor revolutions are complete if a person like her still remains in thedark. Her nurturing hands shall also be the symbolic raised fists against any imminent danger. Where do we trace Amanda’s oppression and concomitant silencing? First, she cannot relate to her husband’s circle of friends. In one scene, she attempts to join a discussion about poetry but only to be repudiated in return. Khalil Gibran – Second, she notices how her relationship to Julian is quite uneven. One time, Julian asks her to reprimand their kid’s lewd singing. She hesitates and tells him there’s nothing wrong with the song. However, when she has heard her husband humming the same song to her, she feels wronged and insulted. This is one of those incidents when one sees Amanda’s relationship with Julian seems disproportionate with regard to what one says to one another for instance and in such situations, Amanda has no choice but to remain silent and kepp her feelings for herself. She will have to adjust to Julian. Thus, Amanda learns to shut up even during dinnertime when her husband talks. In one scene, Julian talks about how they were seduced by the girls and Amanda’s face bears all the marks of insult and humiliation. Amanda’s alienation further manifests in her relationship with Jules, her eldest son who become an NPA agent. The fact that Jules becomes an NPA is already difficult for her to hear. She cannot understand why Jules will have to go away from her. One time, Jules wrote his brother Gani a letter in which he quotes a poem from Khalil Gibran, saying the sons of light do not belong to their mothers. Amanda, upon hearing what Jules wrote, gets hurt. She tries to communicate her feelings to no avail. Her family fails to answer her adequately. Her yearning will only be accomodated at the turn of the events in the country when her son Jules will be one of those political prisoners who will be tortured and Jason will be brutally murdered for no apparent reason by unknown assailants. Amanda cries for justice and when she confronts her husband that they should do something, she learns from him that they are helpless against a fascist oppressive state. Summary executions have been rampant in the country at that time and this only confirms Amanda’s worst nightmares. We learn Amanda’s silence is indeed a symptom of the state’s machinery control and the Bartolome family function as an ideological apparatus in which other institutions like the Church and the school remain subservient to the state in order to perpetuate fascists’ interests and agenda. Restraints – So shoot me. Chito Rono’s “Dekada ’70,.” this year’s Metro Manila Film Festival’s second best picture, is tops for me. Not because I like thedecade and danced to it’s music and gave my mother the same Kahlil Gibran poem about your children not being your children but the sons and daughters of the universe – something like that – which figured in the movie, and fleshed out the pain in Vilma Santos’ mother role. It was one of the most powerful moment in the film, full of undertones and unabashed celebrations fro surviving the most tumultuous decade of the last centure. In that scene, a stoic Amanda Bartolome (Vilma), mother of five boys (Piolo Pascual, Carlos Agassi, Marvin Agustin, Danilo Barrios, John Wayne Sace) and wife of a chauvinist (Christopher de Leon) was cleaning the room of her eldest son Jules (Pascual), who had gone underground, so that her other son Jason (Barrios) could move into it. Jules had sent her mother the Kahlil Gibran poem. With Jason rejoicing in the background, Amanda mubles, “Hindi ko naman daw anak, nagdaan lang naman sa akin, (He is not my son, he just passed through me).” This was the moment of Amanda’s acceptance of Jules convictins, even if she still could not reconcile her role in the changing landscape of her universe. Despite its title, “Dekada ’70” is not all about political activism. It’s about a woman’s struggle to become more than a wife and a mother. It’s wife and a mother. It’s about finding a career and about being proud of herself. It’s about Vilma Santos playing her age in a movie, and defying the harsh lights and theunforgiving close-ups. With the events of the ’70s intruding into her family’s life, Amanda comes to terms with herself and her losses. As usual, Rono has brought out the best his performaers. Restraint was all over the movie: From Christopher, who could not cry despite the death of a son, to Vilma, who kept her discontent in her heart, to the actors who played their sons and in whom you would see a brother, a boyfriend, a husband, a professor, a managing editor. This entry was posted in ARTICLES and tagged Dekada ’70 (2002), FILM REVIEW, FILM REVIEW: DEKADA '70 2/2. Bookmark the permalink.